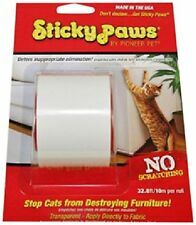 Help keep cats off or out of unwanted areas with Sticky Paws transparent sticky tape designed with a tactile feel cats avoid. This product is easy to apply and remove. 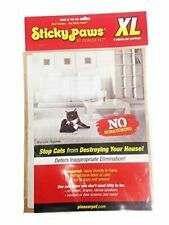 Help keep cat's off or out of unwanted larger areas with Sticky Paws transparent XL sticky tape designed with a tactile feel cats avoid. This product is easy to apply and remove. A cat's need to scratch is instinctive. We hope to see you again soon! HealthyPets mission is to help pet owners improve and care for their pets without having to spend a great deal of money. At HealthyPets, we are dedicated to helping and strengthening the bond between humans and animals by only providing quality products that are U.S.A EPA and FDA approved. Discourages Fur Biting Hair Chewing And Hot Spots. Check out our Large selection of categories for Dogs, Cats,Birds, Reptiles, Fish and NOW Farm pets. Four Paws Keep Off! Repels cats for up to 24 hours when applied daily. Effective indoors and outdoors. Aerosol (170g). Catit Style Scratching Board with Catnip for Cats combine contemporary shapes with stylish patterns, the Catit Style Patterned Cat Scratcher is a modern twist on conventional scratchers. A cat's need to scratch is instinctive. Russian Blue Cat Gift (MUSIC CATS LOVE CD) Vet Approved, Lonely Cat Music - NEW! Music Cats Love CD is a collection of calming music and soothing sounds for the cats we love. Title:MUSIC CATS LOVE: WHILE YOU ARE GONE. Calming music and soothing stories for your cat. Format: CD. His original compositions bring to life this incredible CD. Great to use in multi-cat households, plug in the room that cats frequent most to keep tensions calm. FELIWAY is clinically proven to help reduce behaviors caused by stress. Dogs Cats Small animals Horses Reptiles Fishes Birds. Stress is reduced and the "fight or flight" response rendered unnecessary. It also allows you to have both hands free for exams, routine procedures and grooming tasks. Most importantly, Clipnosis is humane. Check out our Large selection of categories for Dogs, Cats,Birds, Reptiles, Fish and NOW Farm pets. Check out our over extensive amountof. Reduce urine marking and scratching. We provide exceptional quality at a very low price. How long until I get my order?. 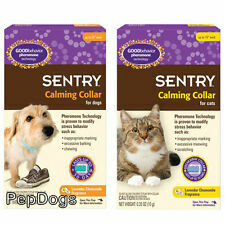 Sentry Calming Diffuser for Dogs. Proven to effectively modify stress related behavior in dogs that may occur during thunderstorms, fireworks, and new social interaction. Pheromone technology is proven to modify stress related behavior such as inappropriate marking, excessive barking, and chewing. Indoor pets often do not get enough exercise. Like children, lack of exercise can and frequently lead to physical and behavioral problems. To keep your family pets active, we are thrilled to introduce the best indoor cat wheel on the market. 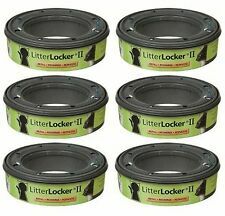 Reload your Litter Locker II pail with this specially designed refill that features material to lock away odors. The plastic film pulls down so you can quickly and easily throw away old litter and prepare a new lining. All Richard’s Organics products are 100% natural solutions for better health. And since there won’t be any changes to our wonderfully natural formulas – you and your pet will both be happy. Proven 95% effective for reducing urine marking. Proven 93% effective for limiting destructive scratching. We provide exceptional quality at a very low price. How long until I get my order?. Ships and Sold by CitiKitty Inc! The Thundershirt is not just for helping frightened cats calm down during thunderstorms. Product Information. Product Identifiers. This corrugated surface provides the perfect way for your cat to naturally manicure their claws and safely satiate their desire to scratch. We hope to see you again soon! Features of the Petlinks Scratch Stop Deterrent Spray. Scratch Stop Training Spray Deterrent Spray SKU: 2637540. Saves furniture, carpets, etc from scratching. Cranbury, NJ 08512. Features of the Litter Kwitter Toilet Training System. Litter Kwitter Toilet Training System SKU: 1226428. Train your cat to use a human toilet in 8 weeks or less. The training is easy for cat owners to understand and use. The original ThunderShirt has the best patented pressure wrap design available. Easy to use, ThunderShirt is adjustable for just the right pressure to calm your dog. Already calming millions of cats, ThunderShirt has over an 80% success rate. PetSafe SSSCAT Replacement Pet Deterrent Spray Can, 3.89 fl.oz. Train your cat to use a human toilet!